STOCKTON, Calif., May 17, 2018 /PRNewswire/ -- In-Shape Health Clubs, California's top destination for fitness and recreation, today announced a partnership with the global leaders in functional training equipment, TRX, to deliver a custom-made education program for all In-Shape personal trainers. 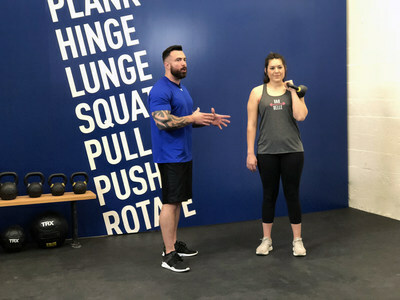 In-Shape master trainer, Damian Weber, using the new MOVE7 system to educate personal trainer Rachel Rodriquez from Manteca as part of In-Shape's investment in team member development and dedication to consistent client experience. In-Shape Antioch personal trainer, Daniel Garces, learning one of the MOVE7 foundational movements – the lunge. In-Shape's MOVE7 training system, developed in partnership with TRX, will enable In-Shape trainers to design personalized programs for their clients with hundreds of exercises that will build strength, mobility, flexibility, power and stamina, all based on a simple and effective set of seven foundational movements. "We are investing heavily in education, training and leadership programs. One of our key priorities is to enable our team members to develop their expertise and skills while building a long term career at In-Shape. We also want to continue to be at the forefront of fitness trends to help our members reach their goals so developing the MOVE7 Training System is a key step. TRX has played a pivotal role in this endeavor," said Francesca Schuler, CEO of In-Shape. TRX Education is designed to help coaches and trainers get their clients moving better using a systematic approach based on seven foundational movements: Push, Pull, Plank, Hinge, Lunge, Squat and Rotate. This methodology can be applied to any type of equipment and individual. 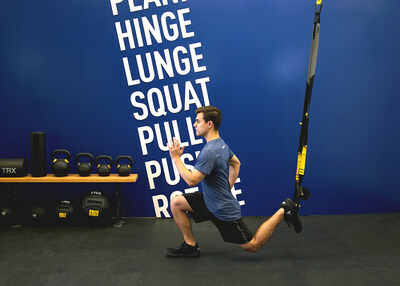 "We developed our education curriculum using the TRX Suspension Trainer and other Functional Training Tools, but it's designed to work in any setting," stated TRX Head of Human Performance Chris Frankel. "Our movement-based approach to coaching will get all of your trainers speaking the same language, which is a valuable prospect for any business," he finished. "We're thrilled In-Shape chose TRX to partner with on their trainer education program. TRX suspension and multi-modality training provides an incredible arsenal of hundreds of exercises that can be tailored to meet the needs of any gym-goer simply by adjusting the intensity level. We're confident In-Shape trainers and members will benefit enormously from In-Shape's investment in this program," said Randy Hetrick, Founder and CEO, TRX. To kick off the new program and the roll out of TRX equipment in all of their clubs throughout California, In-Shape is hosting TRX Suspension Training® demonstrations every Tuesday at 9 a.m. PT and 5 p.m. PT for members. Not a member? Grab a guest pass at the front desk to try it out. As the global leaders in functional training, TRX offers the world's most effective training equipment, training, and education to help everyone, of any fitness level, become a better version of themselves. TRX is also the no. 1 choice of specialized education courses for fitness professionals. They have redefined the application of bodyweight training to enhance human performance and have successfully disrupted the mature landscape of the health club industry. Through a commitment to ongoing research and product development, TRX is changing the way consumers exercise, athletes train for sport, soldiers train for combat, physical therapists rehabilitate patients, and exercise instructors train clients. For more information on TRX, call (888) 878-5348 or email info@trxtraining.com.